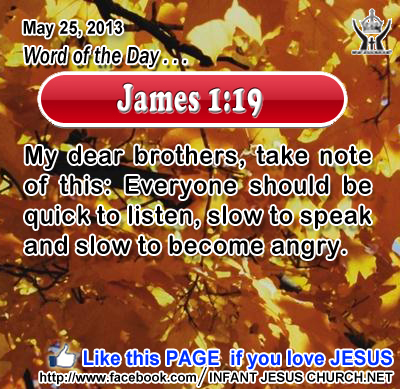 James 1:19 My dear brothers, take note of this: Everyone should be quick to listen, slow to speak and slow to become angry. Heavenly Father, you are incredible beyond our comprehending. How you put up with all the drivel, meaningless and hurtful speech that we and your other children spew out is beyond our understanding. We ask that you release the Holy Spirit to convict our heart and guard our lips from any form of hurtful speech. We want our voice to be as much yours as our heart is. This we pray through Infant Jesus. Amen. 13And they were bringing children to him, that he might touch them; and the disciples rebuked them. 14But when Jesus saw it he was indignant, and said to them, "Let the children come to me, do not hinder them; for to such belongs the kingdom of God. 15 Truly, I say to you, whoever does not receive the kingdom of God like a child shall not enter it." 16 And he took them in his arms and blessed them, laying his hands upon them. Loving Infant Jesus, may we never hinder our youth from coming to you to receive your blessing, help, and rich life. Make our youth strong in faith, hope, and love that they may find true joy and completion in following you as their Lord and Savior. And as we grow with age, may we never drop that child-like simplicity and humbleness which draws us ever deeper into your loving presence.